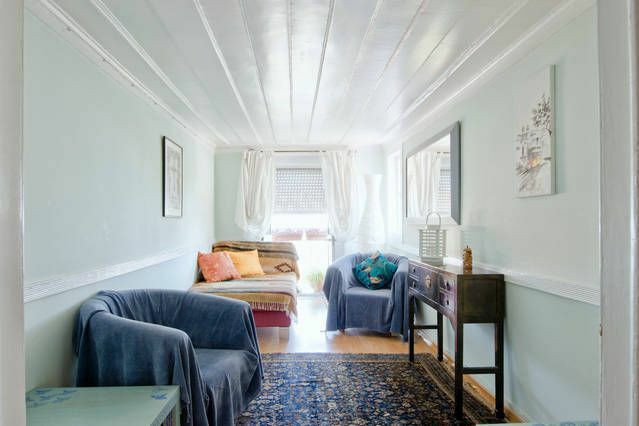 A charming apartment in the historical quarter of Lisbon, which sleeps 3. It is a quiet place on the 4th floor (no lift) of a late 19th century building, light and airy. It has a double bedroom and small single bedroom; living room and separate dining area, and a fully equipped kitchen. The toilet and wash basin are separate from the small shower space. The shower, and wash basin and toilet spaces are small but totally functional. PLEASE CHECK PHOTOS. The top floor location means that the single bedroom, study and the wardrobe room have sloping roofs. The height may not be 2.5m but the apartment makes up for that in terms of its character! Please check under NOTES in the payment section that I charge a late arrival fee of 25.00 euros for arrivals after 21.00. This is paid on your arrival and is not included in the final feels to HomeAway to avoid it being added to your service fees payment to HomeAway. If you like YOGA, there are sessions nearby. Parking in front of the apartment off-road, around the newly designed public garden. There is a mix of pay parking (9.00 -19.00), and some free, and a car park is nearby. To be in Graça is where you will find local life. It's not a touristy area, but somewhere where you will find Fado authentically, friendly folk and a peaceful start to your adventure in Lisbon. This apartment on the fourth floor is full of charm, up high and away in the blue skies of Lisbon. It is light and airy and away from the sounds of the city. The apartment retains its original ceilings and charm, but has been comfortably refitted. You are in a special area of Lisbon (Graça), with its traditional shops and eateries, local fado, and in a traditional building with the light and blue of the skies. Separate toilet/basin from shower. The spaces are small but perfectly adequate. Check photos. Small balcony, not for sitting on, but for taking the air. Make your holiday your own. This is a delightful spot for those looking for a quiet place close to the center of Lisbon. From here you can explore beaches, mountains, and places of interest beyound the city of Lisbon. Great spot to stay...just right for a couple, 3 would work, 4 would be a squeeze. Be aware that there are 4 flights of stairs...nothing to fear just be aware. The #28 tram is right outside your doorstep and will get you anywhere you need to go or to your connection with subway, trains and buses for those out of town adventures. Many good eating spots nearby. Don't be fooled by the distances when you view a map of Graca neighborhood. some blocks are only 50-100ft. long. Got to where after a week we could walk to or even back uphill from Moniz and Chiada areas. Allyson is an absolute gem to work with and have answers to whatever you may need. This worked perfectly for us and we are 75 & 74 years old. Spent 10 days. Good luck and enjoy Lisboa w/Allyson's help. You can't go wrong! Dennis & Dixie, Pecos, New Mexico, USA. Loved staying in this charming fourth-floor walk up in Lisbon right in the "center of everything!" Allyson was a wonderful host. Centrally located apartment in Lisbon was perfect for us while we stayed in Lisbon for the first time. I looked forward to getting home in the afternoon from our ventures out and opening the windows overlooking the street - the breeze was absolutely scrumptious! The apartment is small but spacious. We loved having a washer since we were traveling for a few weeks. The apartment has a nice kitchen and internet. Many things very close by - a Pingo Doce (a chain grocery store), family owned vegetable and fruit shops and many local eateries. It was easy to get to all forms of transport from this location - subway, bus and tram. If we are ever in Lisbon again, this would be a perfect choice! This is a quaint and quirky apartment in a beautiful, traditional tiled Portuguese building. As stated in the description it is quite small but was perfectly adequate for 3 of us. The location is ideal, with fabulous local restaurants, bakeries (for those yummy pasteis de natas), shops and transport. It is a great place to be based as you are away from the typical "touristy" areas but a 15 minute walk from the city centre. Allyson was a very helpful and accommodating owner. Lisbon is a fantastic city with a great (and very reasonably priced ) public transport system. I would recommend the Zapping card which can be used on trains, buses and the metro. Appartement très bien situé , dans un quartier très typique. Commerces à proximité, transports en commun. Idéal pour découvrir la ville. Allyson est d'excellents conseils. Allez y les yeux fermés. Warm welcome. The flat was nice and quiet. We felt safe and had a lovely stay in Lisbon. Alfama is a typical part of the city and it was fine beeing there. We did a lot of walking and never felt like taking the metro or tram. Please notify your gests that the Museo Nacional do Azulejo is closed on May the first at 2 PM (our gide book did not say so)! Pleasant and well tended little place, great for two, probably a bit small for more people. It was nice to be almost up above the surrounding roofs, you had light and could always let in fresh air. Excellent location for exploring Lisbon. Perhaps not the right place if you want to stay in a lot and cater for yourself as there is not that much space to do so, even though the kitchen is basically fine. No need for that either, as there are heaps of good and affordable local eateries just around the corner. Allyson was a very easy-going and relaxed host - we would always like to return. You are most welcome to return! From Lisbon airport, take a 12 minute taxi ride to the apartment. This is the BEST way to arrive. It should cost 15 euros. Or take the metro from the airport to Martin Moniz station, and tram 28 from Marim Moniz (5 stops) to Rua de Graça. The apartment has access to all means of transport. It is on the famous 'tram 28' route which takes you around the cultural 'must sees', 10 minutes walk down to the 'Baixa' and 10 minutes walk to the nearest metro, Martim Moniz. The apartment is in the historical area of Graça in a friendly local neighbourhood, close to the 'Miradouro da Graça' which overlooks the centre of Lisbon, the river Tejo, and across to the 'Castelo Saõ Jorge'. Take your morning coffee or evening relaxation from the 'Miradouro da Graça', where you will find cool breezes, fountains and warmth. It is not far from the well-known flea market, Feira de Ladra in the Alfama district, held on Tuesdays and Saturdays. The local shops are indeed local! Fresh fruit and veg, butchers and bakers, and of course cafés and restaurants, including a couple of very good Indian restaurants. And yes, there is a supermarket! There is also a very local, typical Fado bar which is off the tourist track and so authentic. You really have the chance to feel the real character of local Lisbon and still be close to the heart of the city. Although centrally located, up in the apartment you are away from the noise of the street. LATE ARRIVALS and DEPARTURE TIME - Arrivals after 21.00 pay a late arrival fee of 25.00 on arrival. This is not included in your Homeawy service fees, as it is a personal requirement on my part. This also means it is not increasing your service fees to HomeAway. - The City Tax is also a payment on arrival, which I submit to Lisbon Town Hall... 2 euros per person per night up to 7 nights. - Please expect to leave before 10.30 a.m. I can usually be flexible, so let's manage it on an individual basis. - Arrivals after 14.30, but again I can be flexible.